Tele-Pak, a leading supplier of custom-printed plastic cards and other printed plastic items, is a leading printer of customized plastic key tags. Tele-Pak, a leading supplier of custom-printed plastic cards and other printed plastic items, is a leading printer of customized plastic key tags. 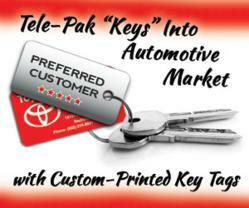 The company website, http://www.plastickeytag.com, offers key tags in a variety of shapes and sizes. A free sample pack of key tags is available upon request. Visitors can get an instant and accurate quote once the job specs are indicated on a simple online form. Tele-Pak key tags are made from sturdy PVC or composite laminated plastic and can be printed in photo-realistic full color and with several personalization options, including bar codes, numbering, signature panels, even magnetic stripes in some cases. Pre-scored holes can be punched out easily for easy key ring attachment. Wallet card and key tag combinations are also available. Tele-Pak Inc. is located in Monsey, NY has been a worldwide leader in the plastic printing industry since 1996, producing all kinds of plastic cards: gift cards, plastic key tags, scratch cards, phone cards, fundraising cards, membership cards and point of sale activation (POSA) cards. Corporate information can be found at http://www.tele-pak.com.